Back in October, I spent a number of hours in one of my favorite places in LA, H.D. Buttercup. It’s an adult’s Disneyland. Seriously. If you are looking for some design inspiration, just take a walk through their showroom. I dare you to take a quick walk – it won’t happen. On this serendipitous October visit, H.D. 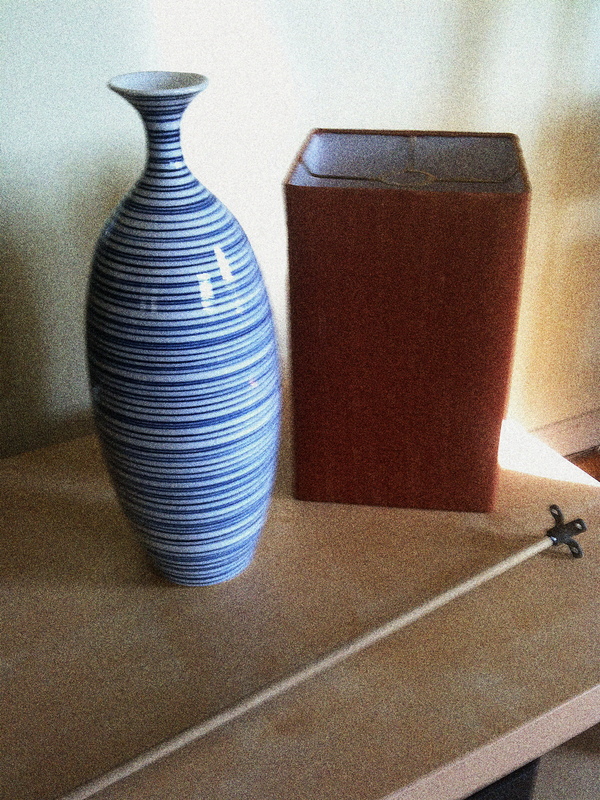 was having one of their clearance sales, and I found the above striped vase for $5 – FIVE DOLLARS. I thought the stripes would breakup the colors in my living room very well, so I snagged one and brought it home. After realizing the vase was too tall to fit in my book shelves, I put it back into its bubble wrap and into its bag, resolved to figure out how to integrate this little piece into the living room. Well after both the vase and the lamp quietly sat in their bags in the corner of the living room for a month and a half, while I was doing my pre-holiday weekend cleaning, I realized I had neglected them. I took them out of their confines, and placed them both on the floor, and realized they actually made a good match together! Enter the handiest and creative better half. I showed him the ‘glamorgains’ (my nickname for glamorous bargains), and he agreed with my pairing. He noticed that the neck of the vase was extremely narrow, but he started tinkering through the junk drawer and with the tool box. After one trip to the local hardware store and some creativity, we added one dowel that fit perfectly into the vase mouth, and added a metal bracket. The last piece was using the sticky goo that comes in the mail with credit cards stuck to the paper – that would keep the lamp shade in place on the metal bracket. 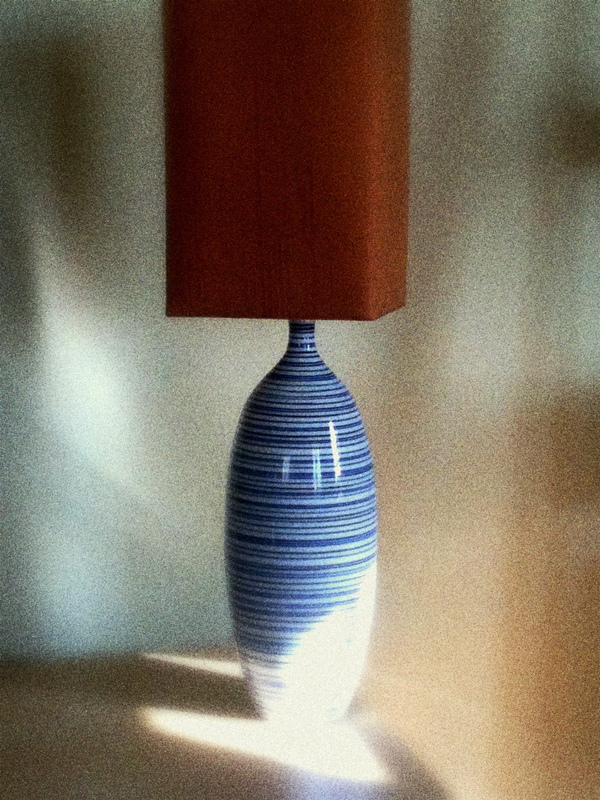 Where there wasn’t a faux lamp before, there is now!!! What do you think? We looked into making this a REAL lamp, but then we risk breaking the porcelain of the vase, and since both pieces were originally for decor, I’m okay with the faux lamp for decor too. Any great DIY ideas you’d like to share? I LOVE DIY projects, big or small. Keeps the creative juices flowing!! This entry was posted in le decor and tagged DIY, home by rebeccawenstrup. Bookmark the permalink.